These web pages give information and data taken from the Royal Dutch Shell plc Annual Report and Form 20-F 2018. They do not constitute the official version of the document filed with relevant authorities. The Royal Dutch Shell plc Annual Report and Form 20-F (this Report) serves as the Annual Report and Accounts in accordance with UK requirements and as the Annual Report on Form 20-F as filed with the US Securities and Exchange Commission (SEC) for the year ended December 31, 2018, for Royal Dutch Shell plc (the Company) and its subsidiaries (collectively referred to as Shell). This Report presents the Consolidated Financial Statements of Shell (pages 167−214), the Parent Company Financial Statements of Shell (pages 237−246) and the Financial Statements of the Royal Dutch Shell Dividend Access Trust (pages 251−255). Except for these Financial Statements, the numbers presented throughout this Report may not sum precisely to the totals provided and percentages may not precisely reflect the absolute figures, due to rounding. Cross references to Form 20-F are set out on pages 02-03 of this Report. Financial reporting terms used in this Report are in accordance with International Financial Reporting Standards (IFRS). The Consolidated Financial Statements comprise the financial statements of the Company and its subsidiaries. “Subsidiaries” and “Shell subsidiaries” refer to those entities over which the Company has control, either directly or indirectly. Entities and unincorporated arrangements over which Shell has joint control are generally referred to as “joint ventures” and “joint operations”, respectively. Entities over which Shell has significant influence but neither control nor joint control are referred to as “associates”. “Joint ventures” and “joint operations” are collectively referred to as “joint arrangements”. This Report contains certain following forward-looking Non-GAAP measures such as free cash flow, capital investment and divestments. We are unable to provide a reconciliation of these forward-looking Non-GAAP measures to the most comparable GAAP financial measures, because certain information needed to reconcile those Non-GAAP measures to the most comparable GAAP financial measures is dependent on future events some of which are outside the control of the company, such as oil and gas prices, interest rates and exchange rates. Moreover, estimating such GAAP measures with the required precision necessary to provide a meaningful reconciliation is extremely difficult and could not be accomplished without unreasonable effort. Non-GAAP measures in respect of future periods which cannot be reconciled to the most comparable GAAP financial measure are calculated in a manner which is consistent with the accounting policies applied in Royal Dutch Shell plc’s financial statements. All outlooks on financial metrics and/or alternative performance measures exclude the effect of the implementation of IFRS 16 Leases, which will take place effective as of January 1, 2019. In addition to the term “Shell”, in this Report “Shell Group”, “we”, “us” and “our” are also used to refer to the Company and its subsidiaries in general or to those who work for them. These terms are also used where no useful purpose is served by identifying the particular entity or entities. The term “Shell interest” is used for convenience to indicate the direct and/or indirect ownership interest held by Shell in an entity or unincorporated joint arrangement. The companies in which Royal Dutch Shell plc directly or indirectly own investments are separate legal entities. Shell subsidiaries’ data include their interests in joint operations. This Report contains data and analysis from Shell’s new Sky scenario. Unlike Shell’s previously published Mountains and Oceans exploratory scenarios, the Sky scenario is based on the assumption that society reaches the Paris Agreement’s goal of holding the rise in global average temperatures this century to well below two degrees Celsius (2°C) above pre-industrial levels. Unlike Shell’s Mountains and Oceans scenarios which unfolded in an open-ended way based upon plausible assumptions and quantifications, the Sky scenario was specifically designed to reach the Paris Agreement’s goal in a technically possible manner. 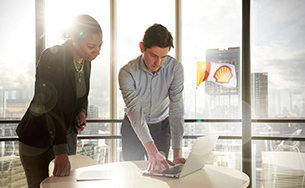 These scenarios are a part of an ongoing process used in Shell for over 40 years to challenge executives’ perspectives on the future business environment. They are designed to stretch management to consider even events that may only be remotely possible. Scenarios, therefore, are not intended to be predictions of likely future events or outcomes and investors should not rely on them when making an investment decision with regard to Royal Dutch Shell plc securities. 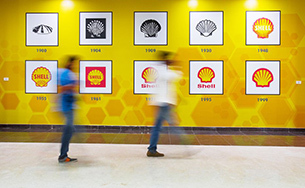 Additionally, it is important to note that Shell’s existing portfolio has been decades in development. While we believe our portfolio is resilient under a wide range of outlooks, including the IEA’s 450 scenario (World Energy Outlook 2016), it includes assets across a spectrum of energy intensities including some with above-average intensity. While we seek to enhance our operations’ average energy intensity through both the development of new projects and divestments, we have no immediate plans to move to a net-zero emissions portfolio over our investment horizon of 10–20 years. Although, we have no immediate plans to move to a net-zero emissions portfolio, in November of 2017, we announced our ambition to reduce the Net Carbon Footprint of our energy products in accordance with society’s implementation of the Paris Agreement’s goal of holding global average temperature to well below 2°C above pre‑industrial levels. Accordingly, assuming society aligns itself with the Paris Agreement’s goals, we aim to reduce the Net Carbon Footprint of our energy products, which includes not only our direct and indirect carbon emissions, associated with producing the energy products which we sell, but also our customers’ emissions from their use of the energy products that we sell, by around 20% in 2035 and by around 50% in 2050. We also refer to “Shell’s Net Carbon Footprint” in this Report. This includes Shell’s carbon emissions from the production of our energy products, our suppliers’ carbon emissions in supplying energy for that production, and our customers’ carbon emissions associated with their use of the energy products we sell. Shell only controls its own emissions but, to support society in achieving the Paris Agreement goals, we aim to help and influence such suppliers and consumers to likewise lower their emissions. The use of the terminology “Shell’s Net Carbon Footprint” is for convenience only and not intended to suggest these emissions are those of Shell or its subsidiaries. This Report contains forward-looking statements (within the meaning of the US Private Securities Litigation Reform Act of 1995) concerning the financial condition, results of operations and businesses of Shell. All statements other than statements of historical fact are, or may be deemed to be, forward-looking statements. Forward-looking statements are statements of future expectations that are based on management’s current expectations and assumptions and involve known and unknown risks and uncertainties that could cause actual results, performance or events to differ materially from those expressed or implied in these statements. Forward-looking statements include, among other things, statements concerning the potential exposure of Shell to market risks and statements expressing management’s expectations, beliefs, estimates, forecasts, projections and assumptions. These forward-looking statements are identified by their use of terms and phrases such as “aim”, “ambition”, “anticipate”, “believe”, “could”, “estimate”, “expect”, “goals”, “intend”, “may”, “objectives”, “outlook”, “plan”, “probably”, “project”, “risks”, “schedule”, “seek”, “should”, “target”, “will” and similar terms and phrases. There are a number of factors that could affect the future operations of Shell and could cause those results to differ materially from those expressed in the forward-looking statements included in this Report, including (without limitation): (a) price fluctuations in crude oil and natural gas; (b) changes in demand for Shell’s products; (c) currency fluctuations; (d) drilling and production results; (e) reserves estimates; (f) loss of market share and industry competition; (g) environmental and physical risks; (h) risks associated with the identification of suitable potential acquisition properties and targets, and successful negotiation and completion of such transactions; (i) the risk of doing business in developing countries and countries subject to international sanctions; (j) legislative, fiscal and regulatory developments including regulatory measures addressing climate change; (k) economic and financial market conditions in various countries and regions; (l) political risks, including the risks of expropriation and renegotiation of the terms of contracts with governmental entities, delays or advancements in the approval of projects and delays in the reimbursement for shared costs; and (m) changes in trading conditions. Also see “Risk factors” on pages 15-20 for additional risks and further discussion. No assurance is provided that future dividend payments will match or exceed previous dividend payments. All forward-looking statements contained in this Report are expressly qualified in their entirety by the cautionary statements contained or referred to in this section. Readers should not place undue reliance on forward-looking statements. Each forward-looking statement speaks only as of the date of this Report. Neither the Company nor any of its subsidiaries undertake any obligation to publicly update or revise any forward-looking statement as a result of new information, future events or other information. In light of these risks, results could differ materially from those stated, implied or inferred from the forward-looking statements contained in this Report. Shell V-Power and Shell LiveWire are Shell trademarks. The SEC maintains an Internet site that contains reports, proxy and information statements, and other information regarding issuers that file electronically with the SEC. 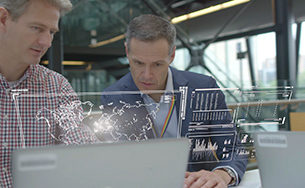 All of the SEC filings made electronically by Shell are available to the public on the SEC website at www.sec.gov (commission file number 001–32575). This Report is also available, free of charge, at www.shell.com/annualreport or at the offices of Shell in The Hague, the Netherlands and London, United Kingdom. Copies of this Report also may be obtained, free of charge, by mail.